Greystoke: The Legend of Tarzan, Lord of the Apes was made in 1984 by a British film director, Hugh Hudson and was based on the novel, by Edgar Rice Burroughs called Tarzan of the Apes. The main stars are Christopher Lambert and Andie McDowell. Audiences welcomed a return to Tarzan stories, and this film was nominated for Best actor, Best Screenplay and Best makeup at the 57th Academy Awards. The story is about the sixth Earl of Greystoke and his wife, who are on a sailing trip and become marooned in Africa. They have a baby boy, but both parents die and the baby, John, is taken by Kala, a chimpanzee,who raises him as her child. This child grows up wild and knowledgeable about the jungle. This boy is eventually discovered by some British adventurers and is taken to London to meet his human family. He meets Jane and they bond together. 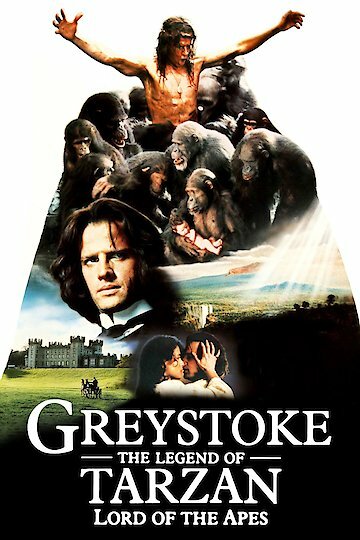 Greystoke: The Legend of Tarzan, Lord of the Apes is currently available to watch free on Vudu Free and stream, download, buy on demand at Amazon, Vudu, Google Play, iTunes, YouTube VOD online.